In a hurry? Make a kit! Kits are a great way to start making wine, but that’s not the way I started. In fact, my first kit isn’t in bottles yet. One thing I learned from making one is that kits are a great way to make wine fast. I get asked about that a lot and I didn’t have many concrete ideas because I usually take my time. Until now. It isn’t just that kits come with simple instructions and a clear schedule, it’s that you can adapt the technique and mindset to conventional winemaking. So if you’re in a hurry, make a kit or three. Learn from it (even if you’re not a beginner) and use as many of the techniques as you can in your next blueberry wine (or whatever strikes your fancy). I’ll have more to say about this after my own kit is bottles. These are new to me, and I expect to write about them in 2011. There’s still a lot to say about more familiar topics, so there won’t be any radical changes. I’m looking forward to the New Year – I think it’ll be a good one! This entry was posted in misc on January 1, 2011 by Erroll. I like to make apple wine, and I’ve noticed it popping up in popular culture. Here’s a list of some references that I remember. Going forward, I’ll update this post with new apple wine appearances as I notice them. And ok, yes, I used to watch “Desperate Housewives.” There. I said it. 00:54:46 What are you talking about? Have you gotten into the apple wine? Burton translated, “Sharáb al-tuffáh” in Arabic to “apple-wine” in 1885. His notes say it means melapio or cider. Does this mean that in the late 19th century, apple wine and cider were synonyms? No one slept, not even Droopeye Dale, an oarsman who had been known to nap between strokes. Some of the men shared a skin of Galbart Glover’s apple wine, passing it from hand to hand. Those who had brought food shared it with those who had not. Have you noticed apple wine in tv shows, movies, or books? Leave a comment and let me know! This entry was posted in Apple Wine on November 29, 2010 by Erroll. My bonsai orchard yielded some terrific plums, but not enough for wine. So when Safeway offered plums at $0.99/lb I jumped at the chance. Here’s how I made 12 lb of plums into a gallon of plum wine. If you’ve looked at other plum wine recipes, you’ll notice I’m using a lot more plums and a lot less water than most people. I’ve made plum wine the traditional way, and I liked it. It was thin, however, and rather than adding bananas, raisins, glycerin, or anything else to give it more heft I decided to just use more plums. I go into more detail about how much water I added and why in the measure and adjust section. I’m making this plum wine a lot like you’d make a rose. One way to make rose is to juice red fruit (or fruit with red juice), and make it like a white wine. So the plan is to juice the plums, add acid (if the titratable acidity is too low) or water (if it’s too high), then pitch the yeast. The big difference from a conventional wine from grapes comes from the sugar and acid content of plums. That will mean bigger adjustments than for a grape wine. I juiced the plums by freeze-thawing and got a 56% juice yield (3 liters from 5.375 kg). That’s a lot higher than for the apples, but I took too long to do it. It was four days from thawing the plums to getting settled juice, and by then I noticed signs of fermentation. Wild yeast or some other unwanted microcritter was helping itself to my plums, so I needed to check the infection and introduce my yeast of choice. I added sulfite immediately, and my yeast had been growing and multiplying in a starter – they should have no trouble dominating the must. This method can work pretty well – I juiced almost twelve pounds of fruit and more than 55% juice with Ziploc bags and buckets – but you’ve got to stay on your toes. Be quick (do as I say, not as I do! ), clean an sanitize thoroughly, and use sulfite. I took the usual measurements of the juice: SG: 1.057, TA: 10 g/L, pH: 3.31. These will be off because of the infection, but it’s better to have data that’s a little off than to go in blind. I decided on a target of 1.100 for the specific gravity and 6 g/L for the titratable acidity, and used the Wine Recipe Wizard to determine the amount of water (0.8 liters) and sugar syrup (1.2 liters) I needed. Adding this to my 3 liters of juice got me 5 liters of must. Most of the work is done. It’s been two months, I’ve racked twice, and there is no sign of off tastes or smells. There will be some waiting while the wine clears and ages, and I’ll need to rack (and measure and taste) a time or two. I might adjust one more time, depending on how the wine tastes and what my measurements show. I expect to bottle some very nice plum wine in six to twelve months. Oh, and the harvest from my bonsai orchard? I thought about tossing those plums in with the store-bought fruit, but I have a better idea. There may not have been enough for plum wine, but that little harvest was just right for a half-gallon of plum liqueur! I’ve made liqueur before, but haven’t talked about it on this blog before – watch for it in an upcoming post. This entry was posted in plum wine, Recipes and tagged nad on September 27, 2010 by Erroll. It got a little more expensive to make mead this year as honey prices rose about 5.5%. All the prices I track were higher in the first half of 2010, with Dutch Gold Clover posting the smallest increase (2.8%) and Costco Clover surging the most (9.3%). Maple syrup and sugar are both down a little (though I only have one source for them right now), and malt extract has been flat. In the table below, I show the honey prices I track and how they changed from the beginning to the middle of the year. The packers offer slightly better prices on clover honey than Costco, but to get those prices you have to buy in 60 lb buckets and pay shipping. Costco lets you buy in smaller 6 lb jugs and avoid shipping charges by visiting their retail locations. The best price around is still Miller’s wildflower – a high quality honey at a great price. It’s also available as a pair of 3 lb jugs from Amazon , but at $3.42/lb this is a much more expensive option. It’s eligible for free shipping though, so if you don’t have access to an affordable local source like Costco, you don’t want to buy in 60 lb lots, and/or shipping for those heavy buckets would eat up any savings, then it might make sense for you. This entry was posted in Mead on August 9, 2010 by Erroll. Over a year ago, Leslie asked me for an easy apple wine recipe with step by step instructions. My first reaction was surprise. She posed her request in a comment on one of my apple wine recipes. That one was pretty easy, wasn’t it? I combined some apples from my backyard with some store-bought juice. All I had to do was juice the apples, add that to the juice I already had, measure the specific gravity and the titratable acidity, figure out how much sugar and acid to add, and … oh. Ok, now I remember what it was like when I was first starting out. I went looking for an easy recipe that didn’t make me run tests or figure anything out. So I thought about it for a bit, scribbled down some things I remembered about apples and apple juice, ran some numbers through a calculator, and whipped up a recipe for her on the fly. I never heard from her and I forgot about the whole thing until I saw some apple juice at Trader Joe’s the other day. I hadn’t made a new batch of wine in a while, so I grabbed it from the shelves on impulse – I was going to make apple wine! Then I remembered. Since a lot of people miss the conversations in the comments, I decided to update it a little and make it a top level post. To each gallon apple juice add three cups boiled-then-cooled sugar syrup (dissolve 3 cups sugar in 1.5 cups boiling water), one teaspoon acid blend, one teaspoon pectic enzyme, and one crushed campden tablet (or equivalent). Sprinkle a packet of Red Star Premier Cuvee, or other wine yeast of your choice, over the must. Stir daily. You should notice fermentation in a couple of days. 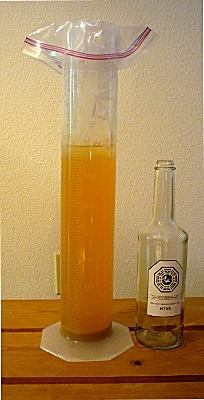 Once it has fermented out (a week or two), transfer to airlocked glass jugs/carboys. Top with other wine, or if you have to, water so that there is no more than one inch of room between the stopper and the wine. In a month or two, you should notice sediment has fallen. Rack into a clean airlocked glass jug/carboy. Add a new crushed campden tablet (or equivalent) every other time your rack. When the wine stops throwing sediment, it’s ready to bottle. If you want it sweet, stabilize and sweeten according to your taste. If you just don’t know how much to sweeten, start with 3 tablespoons sugar/gallon of wine. This scales up easily. Want to make five gallons? Multiply everything, except the yeast, by five. Three gallons? Multiply by three. A primary fermenter, this is what you put everything in at first. A food grade 2-gallon bucket with a lid (not air tight, just to keep the dust and bugs out) works great for 1-gallon of wine that is fermented on skins and/or pulp. An airlocked 3-gallon carboy does the job too, while protecting juice-only fermentation from air. A 6-Gallon Carboy is just the thing for larger batches up to five gallons. Two secondary fermenters. These are usually glass jugs or carboys that you can close with an airlock. One-gallon jugs work great for 1-gallon of wine. Why two? So that you have a place to siphon your fermenting/aging wine into. Extra glass bottles that you can close with airlocks (wine bottles, beer bottles, and so forth). You’ll need these for wine that doesn’t fit when you rack. Racking cane and siphon hose. You should siphon the wine from one container to the next so that it doesn’t splash and pick up too much oxygen. A Stirring Spoon . I like stainless steel because they’re easy to sanitize by boiling; 14″ is a good size for 1-gallon batches. It’s very important that the apple juice have no preservatives – look for “pasteurized” and “no preservatives” on the label. If you see “sorbate” or “benzoate” on the ingredients, don’t buy it. It’s not that these things will do you any harm, but they will prevent the yeast from doing their work. A lot people know they can subscribe to the posts and be kept up to date automatically. But some posts generate a lot of conversation in the comments – most of this goes unnoticed. You can stay in the loop, whether it’s a reply to your question, somebody else’s question, or something totally new, by subscribing to the comments. Update 5/23/2011 – Easy Apple Wine Recipe Bottled! This wine was easy to make. Everything went smoothly and I bottled ten months after pitching the yeast. Using clarified juice meant the wine dropped clear, without fining, very quickly. In fact, I could have bottled at six months. But looks aren’t everything; this crisp dry white has good flavor and I’m looking forward to seeing (and tasting!) how it ages. This entry was posted in Apple Wine, Recipes, winemaking on July 26, 2010 by Erroll. I’ve watched Lost since it premiered, and I wanted to commemorate the last episode. There are any number of ways to do that, but for me it starts with the food. And the wine. And the wine? Here I have a dilemma. I want something I really like – my simple mead recipe turned out great (took really well to oak – is aging beautifully) and I think it would go well with the fish biscuits. I’d also like a wine with a Dharma label, and that would be my wine from supermarket grapes. Unfortunately the label is the best thing about that wine. I could relabel one bottle of the mead, and I might do that. I could “have my wine and drink it too” by opening both bottles. Probably not. Maybe we’ll open the mead, and the Dharma wine will just show up for a photo op with the fish biscuits. So I haven’t nailed down all the details, but we’ll have good food, good mead, and watch the finale of Lost. It’ll be fun! This entry was posted in Competitions and Events on May 17, 2010 by Erroll. As a wine (and mead, maybe cider, sometimes beer) maker, I’m always learning. It can be exciting to uncover the details of an unfamiliar yeast strain or the chemical composition of fruit, but as one of my wine making friends reminded me, sometimes the most important lessons – the ones that can have the biggest impact on your wine – are the mundane ones. Like pay attention, get organized, and plan ahead. I don’t know how he’d feel about me relaying his story of how he lost 5 gallons of promising wine, but fortunately (?) I’ve made plenty of my own mistakes. My very first wine got off to an exciting start, and I checked in on it hourly. I worried and doted over every step. Did I add just the right amount of tannin? The right kind? How about acid? Should I have used a different yeast? It’s been hours since I pitched the yeast – how come it’s not fermenting yet?!?! I needn’t have worried about any of that and not just because it was destined to come crashing down – literally – and spread out over the floor as it flowed over and around the shards of broken glass. Nope. None of the those things mattered one bit. And I now know they wouldn’t have mattered even if I had been paying attention to my entire setup during the First Racking. It wasn’t just the first time that particular wine would be racked (siphoned from one container into another) it was the first time I had ever siphoned anything. So it was a big deal and I was determined to Do It Right. That meant no splashing. The whole point of siphoning is to transfer the wine without incorporating oxygen into it, so I was very intent on the end of the siphon hose – getting it into the receiving vessel quickly and smoothly, getting (and keeping) it submerged as quickly as possible, and keeping the vessel stable to it didn’t agitate the wine. I wasn’t wrong about any of that, and I did them all pretty well. I just left out a thing or two that proved to be important. Like making sure the siphon hose was long enough for the height of my counter and the size of the 1-gallon jugs I was using. And keeping in mind that tugging on the (slightly too short) hose to get it and keep it submerged didn’t just reduce splashing but also pulled on the jug of fermenting wine sitting on the edge of the counter just above me. And that just because it didn’t fall right away didn’t mean that, as the racking progressed, the constant tug of the siphon hose wouldn’t overcome the (steadily falling) weight of fermenting wine holding the jug in place. It would have been helpful to learn all of those things a litter earlier than I did – yeah, that would have been great. Instead the 1-gallon jug with about half a gallon of fermenting wine came down with a … well I don’t remember exactly what it sounded like. I just remember being snapped out of whatever I was thinking about, which was probably how great the siphoning was going (no splashing here! ), to find myself barefoot, wearing shorts, and sitting cross legged on my kitchen floor surrounded by shards of glass (from really big to really small and everything in between) and about half a gallon of fermenting wine spreading out over the floor. That was, um, discouraging. But I survived (I don’t know how, but literally without a scratch) to make wine another day. The remarkable thing is that I’m still learning from that all these years later. Yes, I make sure about the length of my siphon hose and that jugs and carboys are secure as I siphon from them. But today I realized the most important lesson is to develop an efficient and reliable procedure for each step in your wine making. Things like racking, bottling, testing, making up a must should all have a tried and true checklist – literally a written list of every item you will need and every step you will take. No more discovering at the last minute that the racking cane’s foot didn’t get sanitized or that you don’t have enough containers of the right size for all the wine your’re going to rack, or … anything. Each of these processes are simple enough that we ought to be able to do them the same way each time. No surprises, no mistakes, so the excitement in homemade wine can come from how it tastes. This entry was posted in winemaking on May 10, 2010 by Erroll.